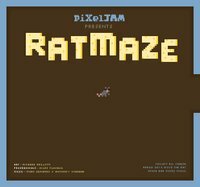 Ratmaze is a decent Flash game in which your objective is to guide a rat as it attempts to collect all the cheese hidden in a labyrinth. Use the arrow keys to move, and press space to turn music on or off. There's an additional button which is only revealed in a certain area, while another secret room offers an easter egg. Pretty fun to play but only for the first try.